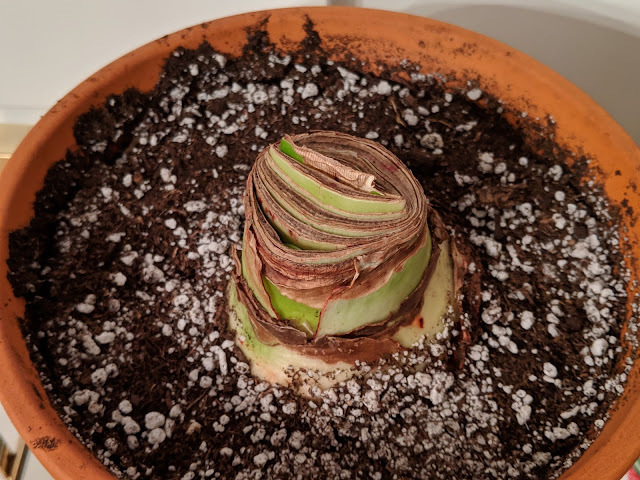 One week in with our 2018 edition of the amaryllis bulb and I'm happy to report that there's a little bit of action going on here. Here's the post showing the bulb both before it went into the pot and right after. If you look closely at this photo above, you'll notice two things: First, the tiniest little green shoot emerging from the middle (top part of the bulb in this photo) and a good-sized 'gap' that has been created near the bottom of the bulb in this photo. Thinking that the 'gap' that is being made is the result of some growth down below and just kind of *making room* for even more green shoots to emerge. As a reminder, this is a double-flowering Nymph bulb that has white flowers with some red/pink accents. I'll keep an eye on this, but I'm hoping that by mid-December, we'll have a nice-looking plant beginning to head skywards. Here's the bulb from 2017 on December 16th to give you a sense for what should take place over the next 18 days or so.